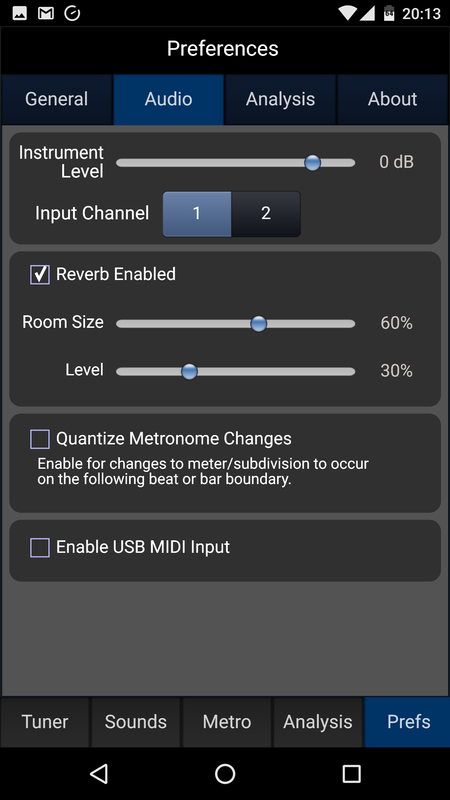 While it’s been awhile since I’ve done a tuner/metronome app review, I’ve been wanting to do a write-up of TonalEnergy for a while. It is an incredibly popular app for all levels of musicians, and it may be most commonly known as the app that has a smiley face when you play a note in tune. 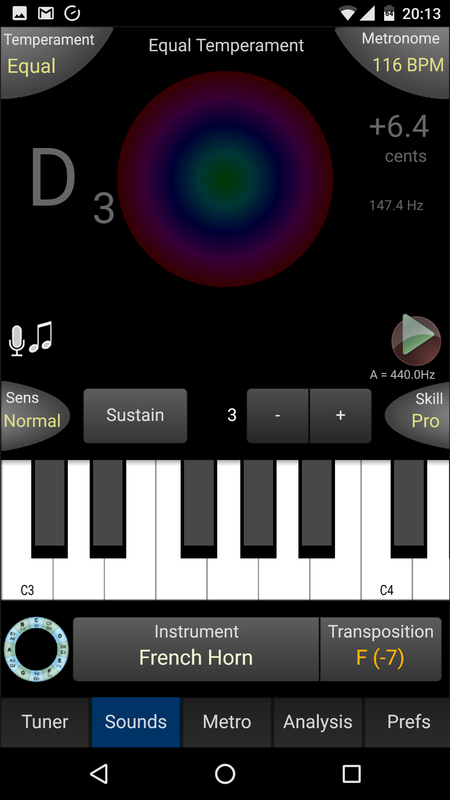 TonalEnergy is available for iOS and Android devices and is one of the most full-featured musical app suites available. 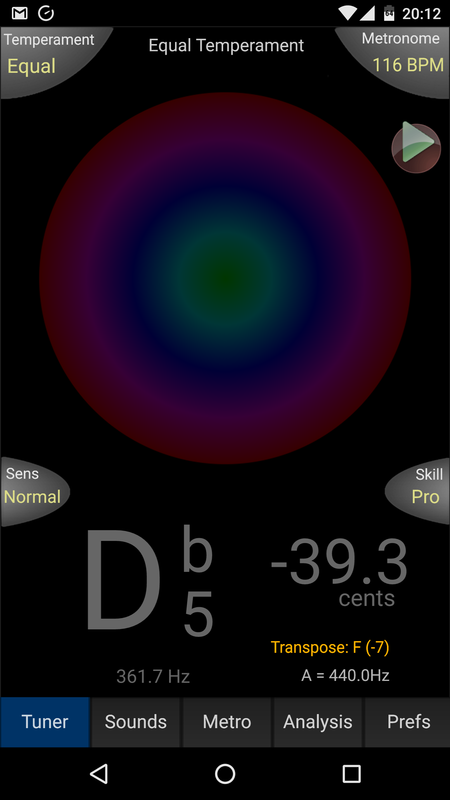 With a tuner, pitch pipe, metronome, waveform/harmonic analysis, and recorder, there’s not a lot that this app can’t do. While all these features are nice, how well it does is probably the most important consideration, so let’s dive in! The main TonalEnergy tuning page. The pitch pipe page with the “circle” buttons. The pitch pipe page with the keyboard. The pitch pipe page with strings. TonalEnergy Android options – page 1. Fully-featured. There’s not a lot that this app can’t do. 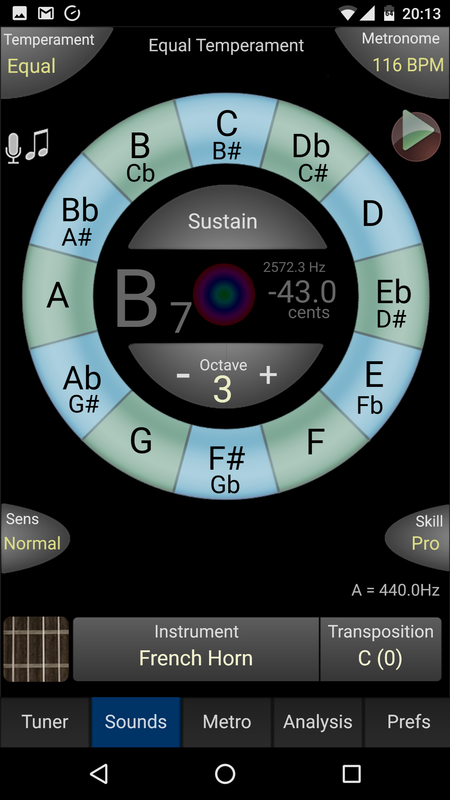 The tuner features a choice of several types of temperaments, along with the option to create new ones. Three different skill levels give a range of what is considered “in-tune”. The pitch pipe features a lot of different sounds. Not just different waveforms (square, saw, etc.) but also different instruments, along with automatic transpositions when you select a transposing instrument. Three different pitch pipe screens – a chromatic circle, guitar strings, or a piano keyboard. 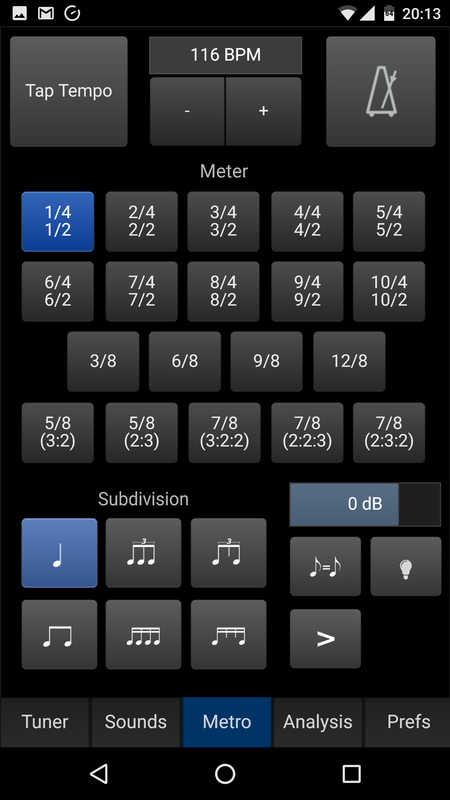 The metronome features just about every subdivision and time signature you’ll need. 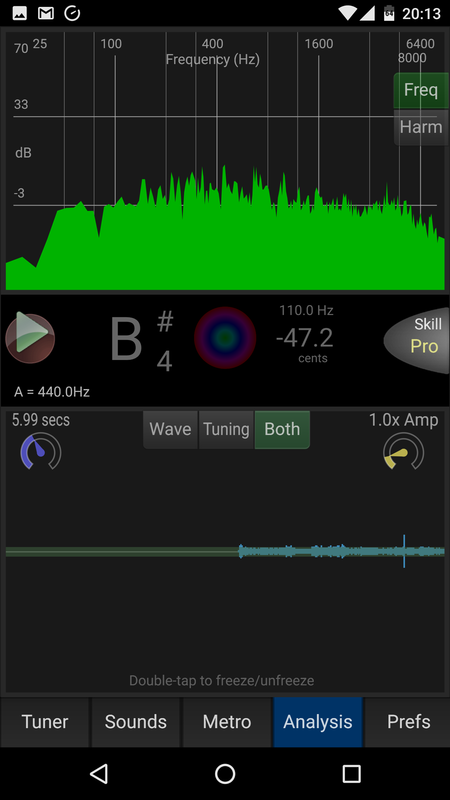 Analysis screen can show either a waveform or the harmonic content of the note you are playing, along with a pitch plot that shows your intonation over time. The recorder is simple (compared to the other app features), but functional. Although this app is quite feature-rich, the app design makes it a bit hard to find some options, and the app is not quite as elegant-looking as some. While I don’t know about the iOS version, there are some occasional bugs in the Android version – sometimes the metronome sound stops or settings aren’t saved from one app session to another, or the pitch pipe gets “stuck” on. Not deal-breaking, but certainly annoying. There’s no easy way to make large, quick adjustments in the metronome’s tempo. You must either tap (which takes 4 taps before it suggests a tempo) or use the +/- buttons. You can hold them down, but a draggable slider or way to quickly skip 15-20 BPM in a single click would be a bit easier to make fast adjustments. Like the name suggests, Tonal Energy is really focused on tuning and intonation, and it shows. 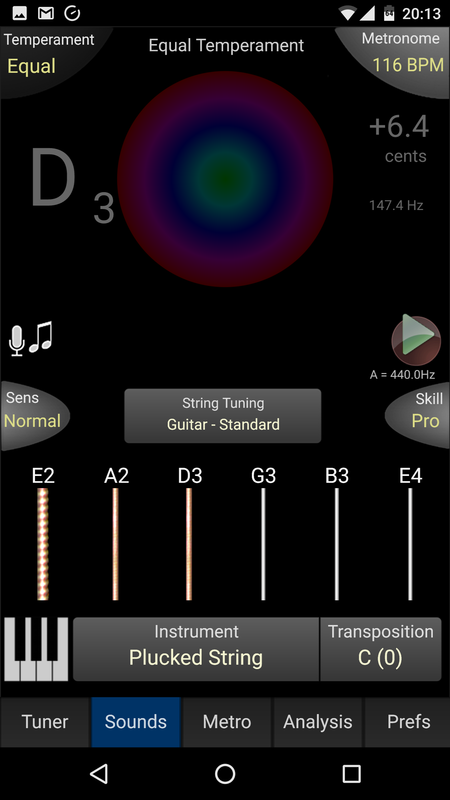 By far the most versatile part of this app is the tuner and tuning-related functions. The main tuning screen gives a large and easy-to-read tuner, with a nice smiley face when you are in tune. The bottom of the tuning screen gives you additional information, such as the pitch you are playing, its deviation from in-tune in cents (to the tenth of a cent), it’s frequency in Hertz (to the tenth of a Hz), your current transposition, and the current concert A frequency. Additionally, there are five buttons to access some quick settings. Starting on the top left, you have access to an alternate tuning system (set in preferences), on the top right you can turn the metronome on or off (although you can’t change tempo), immediately below the metronome is the recorder button, toward the bottom-right side you can set the skill level (how close to in-tune to get the smiley face), and on the bottom-left side you can set the sensitivity (although I didn’t find much need to change it from “normal”). The tuner seems quite accurate – a generated 440 Hz tone registered almost immediately and was within a few tenths of a cent of in-tune throughout its duration. If you have the sensitivity set to high, however, sometimes moving the phone or tablet can cause the measured pitch to vary, so just be aware of that. This screen contains all the same information from the tuner screen (although the tuner is smaller), and a pitch pipe. There are three different types of pitch pipe – a wheel, string, and piano. I prefer the wheel since it is the easiest to use for me on a 7-inch screen, but the keyboard and string can both be very useful depending on your usage requirements. Toward the bottom-center of the screen, there is a large rectangle to select your sound. A couple of very nice features – when you pick a sound (say, trumpet or French horn), the tuner will automatically set the transposition for that instrument for both the pitch pipe and the tuner, as well as limit the pitch pipe’s range to the approximate range of the selected instrument. You can manually change the transposition (if you want a trumpet in C, for example), but it’s nice that it sets this up for you automatically. There are also standard synth wave sounds (sine, saw, and square) if you prefer. The sounded pitches also adjust to the temperament that you select, so you can hear the difference between Just and Equal temperament. Or you can hear just how crunchy some of the alternate tunings can be in certain keys. 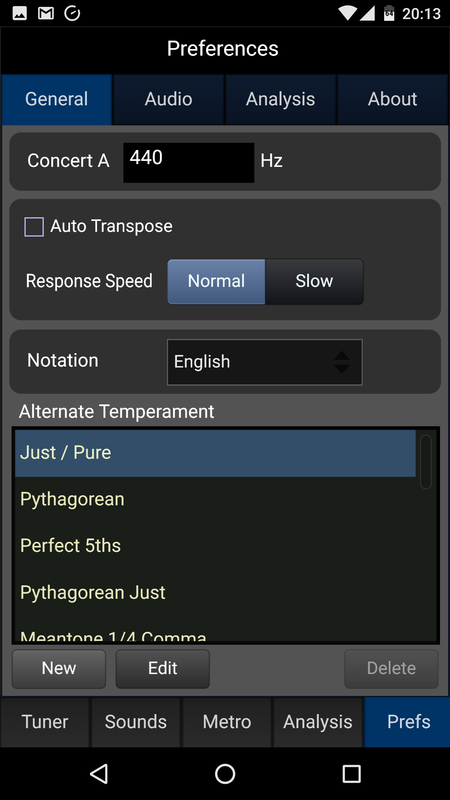 You still have the easy access buttons to the alternate temperament, metronome, skill, and sensitivity settings that you had on the tuner page, as well as access to the recorder. Once nice feature is the ability to change the home key of the alternate temperaments by simply double-tapping on a specific note in either the keyboard or pitch circle view. One unique feature that I haven’t seen on many of these apps (yet) – the microphone/eighth note icon in the top left starts a pitch recognition and playback feature. Essentially, it attempts to recognize the note you are playing and play it back to you. 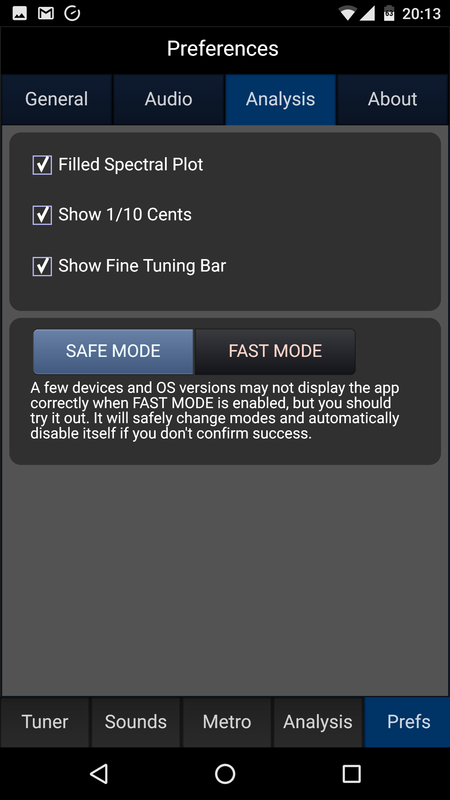 This feature works best with headphones (maybe only in one ear), otherwise, the tuner may not be able to hear you over its own generated tone, or it would be difficult to hear the tuner over your own playing (especially if you play a brass instrument). The metronome is straightforward and simple but also features lots of options. You’ve got + and – to select tempo (along with a tap tempo function), then just about every time signature you could ask for, including some commonly-seen compound meters (5/8 and 7/8 with various beat groupings). Below that are all the basic subdivisions up to sixteenth notes, along with a slider for additional volume, downbeat accent, lights, and an option to maintain the 8th note duration when switching between a x/4 and x/8 meter. I will say that while the metronome is certainly functional, there are a few options that I wish it had. Probably the biggest one would be a way to increase or decrease the BPM quicker. A +/- 20 BPM button or a way to cycle through major tempos (adagio, andante, allegro, vivace) would be ideal. Additionally, further subdivisions (quintuplets and sextuplets especially) would be a nice addition to the subdivision section, and maybe a couple of different sound options – although this last one is much less important. This screen is the one that sets TonalEnergy apart from most other smartphone tuners, and the one that has the most inconsistency (at least in my experience). This screen shows lots of information. At the top, you have either a spectral graph showing your sound in Hertz or showing the harmonic energy (basically the overtone series) of a specific note. On the bottom, you have your pitch plotted in time, so you can see the steadiness (or unsteadiness) of your tone. This is similar to Tunable’s tuning screen, although this one is adjustable along both the X-axis (to see a longer slice of time) and the Y-axis (in case the volume/amplitude exceeds the screen). You can double-tap on either the top or bottom screen to freeze it, and you still have access to the skill level toggle as well as the recorder function. This screen is great for analyzing your sound – especially if you’re working on the quality or timbre of your sound, sometimes it helps to visualize the differences as well as hear them. The biggest concern that I have with it is the quality of its information depends heavily on the quality of the microphone that is being used. The iOS version of TonalEnergy allows you to use an external Bluetooth microphone, but the Android version is limited to using your phone (or tablet) microphone, which are more tuned to the decibel and pitch range of the human speaking voice, rather than musical instruments. Despite these drawbacks, the Analysis screen is a great addition to a tuner app. Although the sound recorder is not a separate tab at the bottom, like the other four sections, it is still very useful and thoughtfully integrated. You can use the analysis screen while listening to a recording. In addition, closing the recording window doesn’t stop the recording playback, so you can use both the top and bottom analysis windows. When using the sound-generating screen, there is an option to record its output only. This way you can make your own drone track to play along with, using any of the different temperaments to tune to. These recordings don’t use the external microphone at all, so you don’t have to worry about background noise or interference. You could also use this feature to record short musical ideas (either using the keyboard or guitar sound generating screen). There is an option in the preferences screen for reverb, along with selectable room size and level. This no substitute for recording in a good room (nor will recordings made with your phone’s microphone have great audio quality) but it is nice to have the option. Overall, this recorder will do just about everything you need it to do, without being overly complicated or including lots of unnecessary features (like lots of different effect options that would mostly go unused). In general, TonalEnergy is a great tuner app in terms of features, but the execution for Android leaves something to be desired. I don’t know if there are these random problems in the iOS version (let me know below in the comments, please! ), but they are just annoying enough in the Android version to make using it a little annoying. TonalEnergy is available on both iOS ($3.99) and Android ($1.99), and is well worth the cost! ← MKBHD Video – USB-C Made Interesting?